Since 2007, farm-product prices have rocketed and plunged, causing hunger, malnutrition, and social and political upheaval around the world. 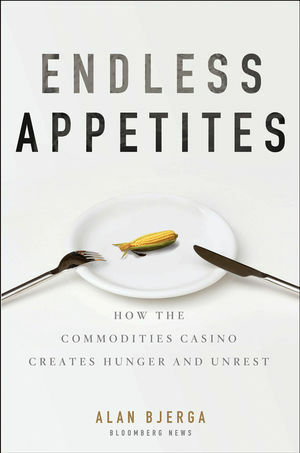 Endless Appetites explores how "food security," the availability of food and the reasonable ability to buy it, has become one of the most challenging topics of our time. With every jump in grocery-store prices, the issue becomes more and more pressing, proven by this year's record increase in food prices, which has already topped the spike of 2008. Why is this happening when more food is being grown than ever? Why are crop markets?first established in the 1800's to help stabilize agricultural commodity prices?acting like an investors' casino, with prices absorbed by rich nations taking food from the mouths of the poor? To understand the growing international food crisis, readers need an expert they can rely on. One of the most widely acclaimed journalists on food security, Alan Bjerga is up to the task, taking readers from the trading floor of Chicago to the highlands of East Africa to the rice paddies of Thailand on a global trek to find the causes of the food-price crisis?and the solutions. Alan Bjerga has covered food and agricultural issues for more than a decade for Knight-Ridder Newspapers and Bloomberg News. He won the Glenn Cunningham Agricultural Journalist of the Year Award from the North American Agricultural Journalists in 2005. In 2009, he was recognized for covering U.S. food aid and famine in Ethiopia by the Society of American Business Editors and Writers, the North American Agricultural Journalists, the New York Press Club, and the Overseas Press Club. In 2010, Bjerga was President of the National Press Club and the North American Agricultural Journalists. "Worth checking out … Based on the author's personal visits to farmers around the world, Bjerga explains how the crisis happened (short answer: greed), it’s tragic effects, and what now has to be done to reverse them." "Some of Bjerga’s best writing is about the inner workings of the Chicago Board of Trade and other markets, and when he brings American agricultural history into the story of what other countries have not had and do not have to encourage stable agricultural development. … Bjerga’s skill is in the way he forces the reader to make connections between aspects of agriculture that do not normally appear together. And the book is chock full of unusual observations." “My Thanksgiving holiday book discovery will become Christmas season reading. ... Lest you think this is just another rant at financial and trading institutions, be aware that Bjerga is a veteran commodities writer and Washington correspondent."